We happened to be in Toronto for a couple of days, staying at the downtown Hilton, and looking for a place to dine, I stumbled on a brewpub called the 3 Brewers. 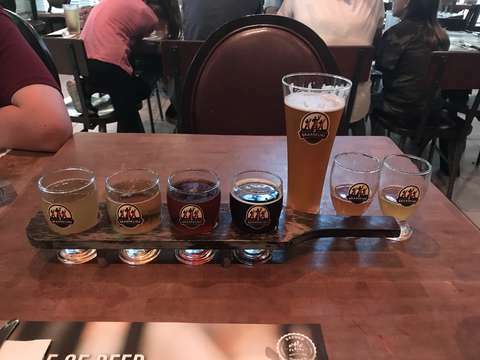 It seems to be a Québécois outfit, since their real name appears to be Les 3 Brasseurs, and they have locations in Montreal, Quebec, Ottawa and Toronto, the latter being located near the corner of Adelaide and Sheppard in the downtown financial district, just a block from the Hilton. The area in that block is under construction so finding the entrance sorely challenged our weary navigational skills, but once we found it, we were welcomed and seated quickly. The menus were made out to look like a newspaper, for some reason which escapes me. This aspect seemed a bit out of the blue, and not really related to the atmosphere, name or business, but I suppose it was just an attempt to stand out, be quirky or something. Or maybe appeal to the businessmen in the area, some specimens of which were at a nearby table engaged in loud and tipsy conversation often observed in business dinners. The food wasn&apos;t exactly haute cuisine, but there was some traditional modern brewpub fare. 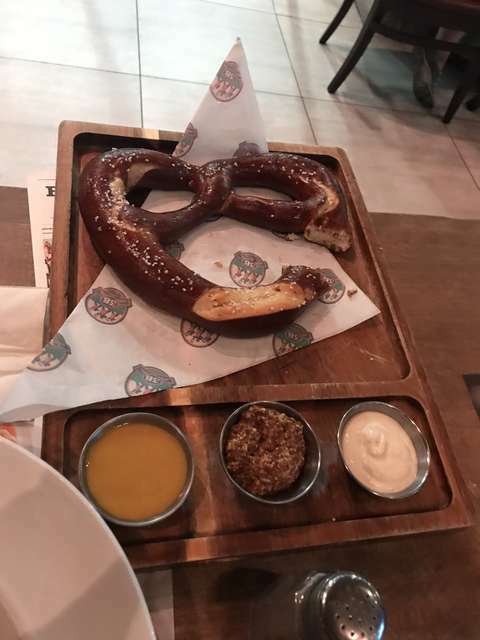 A giant pretzel appetizer was good, and accompanying spicy mustard was yummy (as was the honey mustard). A humongous Caesar salad was quite good as well. 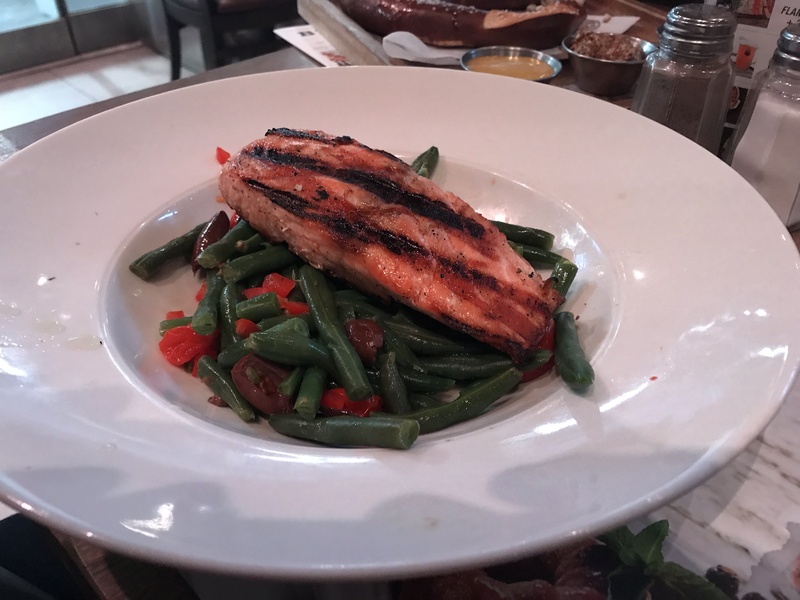 My salmon dinner was overdone, tasted like farmed Atlantic, and was served over a way-too-overwhelmingly-plentiful bed of tough green beans; both the salmon and green beans lacked any appreciable seasoning or spicing, requiring copious quantities of table salt and pepper. A desert of three different small cheesecakes served in mini mason jars rounded out the meal nicely, and surprised us in its deliciousness. As for atmosphere, and general thoughts about the premises, the inside dining area had a cozy but modern feeling, the dining room had a round of TVs (showing sports and news programming) in a circular "hole" in the ceiling that also allowed a view of the upstairs dining area; it was architecturally interesting, and at the same time functional, but a little weird and busy-feeling. It probably appeals to drunk Canadian businessmen, though, so I suppose it makes sense for the locale. The entrance had a view of a set of stainless steel serving tanks upstairs, which was one of the rare concessions to this being a brewpub, and the beer being presumably brewed onsite. The overall impression was subtle, not in-your-face brewery-feeling, more like a restaurant with some behind-the-scenes implementation details showing. We only ever saw one server, and this resonated with a generally slow and inattentive service, but this was not overly annoying, and the server certainly tried hard to be helpful and accommodating. One of our party is gluten-free, and the server had to check whether a dish fit the bill, but this seems to be par for the course in Ontario (as with most of the mid-west), so again, no biggie there. I guess if I had to sum it up, I was neither overly impressed, nor terribly let down. Kudos for some experimentation in their special brews, but the running house brews were nothing to rave about.